have links for all the items I show. If you like videos watch it here or below. shoe styles just to show you how you can change the look. Here is the same outfit, but with a pair of ankle boots. I love how shoes can change an entire outfit. This cute trendy top is both functional and practical. The ruffle sleeves add just the right amount of detail to this piece. scarf which I love wearing in the Fall. 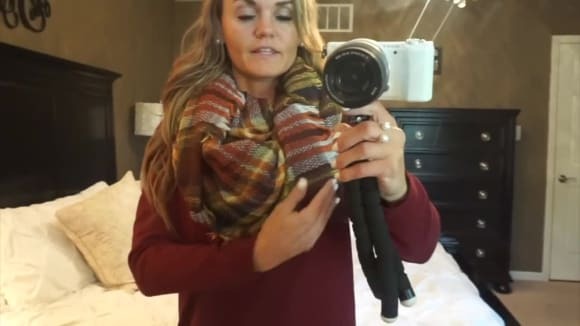 If you have ever wondered how to wear a blanket scarf I have a blog post and video showing how. You can see it here. I purchased this top over the summer and unfortunately, it’s no longer available. I am linking a similar Fall top. Sweatshirts with cute saying are always great for a casual comfy look. too. I layered it over a chambray button up and a dress I had for summer. Still wearing the same outfit, but with a pair of ankle boots. You can even leave the chambray shirt out and just use the sweater to layer.